Each year during Black History Month, Md. 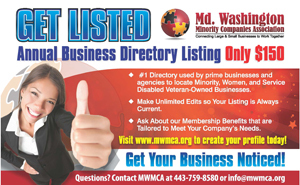 Washington Minority Companies Association (MWMCA) feels a renewed sense of pride while reflecting upon the many accomplishments we’ve achieved including: hosting and logistically organizing minority and women business outreaches and events, assisting businesses with the minority business certification application process, providing payment and project dispute mediation for small businesses assisting major corporate and advertising business, products, entities in locating new customers, opportunities and events. Each of these efforts align with our primary mission to, “Connect Large & Small Businesses to Work Together.” None of this would be possible without those that have come before us. U.S. Congressman Parren J. Mitchell and Maryland State Senator Decatur “Bucky” Trotter were Maryland legislators who introduced M/WBE legislation both federally and in Maryland that became laws. Other voices who advocated for minority and women owned firms are Arnold A. Jolivet, Esq., Robert “Bob” Clay, Avon Evans, Rev. Douglas Sands, and Anthony “Tony” Robinson, Esq. In 2003, my endearing wife Patricia and I decided, after serving decades in the commercial banking industry, to provide the necessary services needed for small, minority and women owned business to take their businesses to the next level. After 16 years, we have evolved to not only servicing the construction industry, but other industries including: energy, utilities, gaming, engineering, healthcare, real estate development, education, and many more. In today’s weekly e-newsletter, we salute the Rev. Dr. Martin Luther King, who withstood bigotry and hatred, and is one of the world’s chief leaders who fought for social and civil rights. 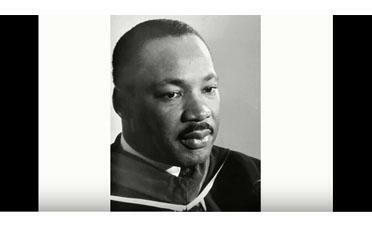 We’d like to share his speech to Philadelphia’s Barratt Junior High School students in 1967, where he urges them to prepare their life’s blueprint and embrace their potential; we believe his message still resonates today.